Peoples’ faces take on a dreamy expression when they talk about Grafton, Vermont. Viewed from the rocker-lined porch of the Old Tavern and Grafton Inn, the village center is straight from central casting. Tweak a few details, and the sprawling inn, clapboard houses, steeped church, tiny pond, sheepfold, and grassy lawns could fit into the mid-1800s. Today’s restful oasis is the outcome of generations of determination, dollars, and muscle. In the 1800s, Grafton was a busy town of farms and small industries. Changing economic times whittled the town’s commercial life down to a near-standstill by the 1960s. That’s when the Windham Foundation was created to save the community. The foundation bought and restored many buildings in town and revitalized the foundering Grafton Cheese Company. Today, Old Tavern and Grafton Inn, Grafton Ponds Outdoor Center, and Grafton Cheese Co. are the economic engines for local families and for the town’s tourism industry, which welcomes new and repeat visitors in all seasons. Visitors come to Grafton (pop. 650) to escape media, noise, and bustle; to enjoy fresh foods, especially Grafton Cheese, a hand-made cheddar; to hike, ride mountain bikes, and do Nordic skiing, snow shoeing, and snow tubing at Grafton Ponds Outdoor Center; and to browse a doll-house-size nature museum, antique shop, art gallery, blacksmith shop, village market and café, and wood working studio. Grafton is about a 45 miles north of Brattleboro and 20 miles west of Bellows Falls, which is on the Connecticut River, the north-to-south border of Vermont and New Hampshire. The nearest interstate highway is the north-south I-91. 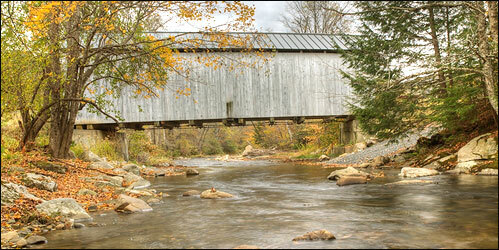 For Grafton, get off I-91 at Bellows Fall and travel west on Route 121, which follows close to the Saxtons River. The drive along Route 121 follows turns in the rocky-bottom Saxtons River, a familiar feature of Vermont’s small river valley towns. Big machinery, garages, woodpiles and parked trucks remind you that many Vermonters work with their hands, on the land. No big-box stores and few national chain names mar the home-grown landscape (most of Vermont prohibits roadside billboards, btw). The social and economic heart of the village is Grafton Inn and Old Tavern on Main Street, which has been sheltering visitors since 1801. This is an authentic early-American building, and one thing you know about lodgings like this is that they take on a fresh and pleasurable character with each change of season. When you arrive, the innkeeper, Angela Comstock, or her staff greet you at a tiny counter behind a cozy front parlor with a couches grouped around a fireplace. Although the décor looks like John Adams could come striding in at any moment, shaking off road dust and horsehair, behind the check-in counter are up-to-date computerized reservations systems, and on the coffee table are copies of USA Today, the Wall Street Journal, and the Brattleboro Reformer, the local daily. WiFi is available. The Inn offers rooms and suites in its main building and four nearby guest houses, all of them restored 19th-century buildings. Whole families or groups can take over guest houses, serene and warm places of wide-plank floors, spacious fireplaces, and décor in turn with the early 1800s. Bathrooms are modern and plush, and gadgetry like TVs are present if you want them, but not obtrusive. A small pond behind the Main Street is a summertime swimming hole for Inn guests. The main Inn has a formal dining room called the Old Tavern Restaurant, and just a step down is a bright, airy, plant-filled breakfast room with big windows looking onto an adjacent patio. Just a few steps from the Inn’s back door is Phelps Barn Pub, a rustic space with a lively bar perched in a loft overlooking the main floor. If you are lucky enough to land at Phelps Barn Pub on a Thursday evening, do not miss the weekly burger and beer special – it is the most flavorful burger you will ever taste. This is also the evening that local folks traditionally gather at Phelps, and the conversation from table to table, along and across the bar is friendly and fun. Chef Cal Hingston reigns over the food and beverage department. He is a graduate of New England Culinary Institute in Montpelier, the state capital, and he has cooked at the Norwich Inn and Putney Inn. Like most people in the culinary arts in Vermont, Chef Hingston emphasizes that his food – particularly produce, meats and cheeses -- comes from Vermont producers, and is prepared to order. Fresh, fresh, fresh. Menus change with seasonal crops: fiddleheads in spring, fresh tomatoes and herbs in summer, some of this coming from the Inn’s own greenhouses. Breakfast presents a new muffin every day; the poppy seed and the chocolate banana muffins are pure pleasure on the tongue. Asked what his favorite dish is, the Chef has to choose the Vermont-sourced rack of lamb. Grafton Cheese Company, also on Townsend Road just outside the village, welcomes cheese heads to watch cheddar cheese being made by hand and to taste, taste, taste. 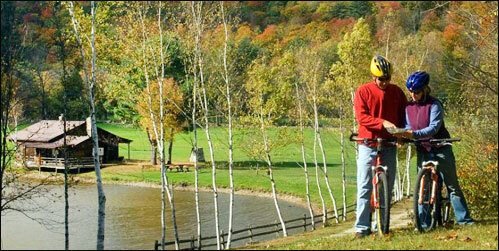 This is one of the historic industries resurrected by Windham Foundation. The company also has a larger Specialty Cheese & Wine Shop on Linden Street in nearby Brattleboro, where production takes place for longer hours and there’s more to see and buy. 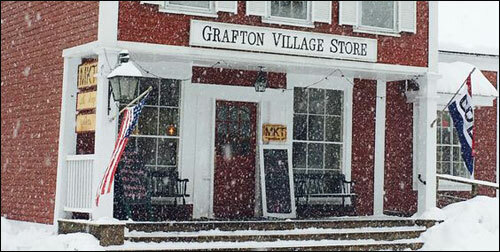 Grafton is proud of its cheeses, sold everywhere, including the town’s Village Store. The Nature Museum at Grafton is a tiny place packed with knowledge and activities about the region’s plants, animals, and geology. Hands-on exhibits, dioramas, and mounted specimens engage learners. ​Visitors can crawl through an underground bear den, dig for fossils, find out about bats and catamounts, and dress up as their favorite creature. Grafton Forge Blacksmith Shop is a place to see and learn about this historic art in action, and also to buy contemporary ironware for use in the home. The shop has a fascinating collection of historic tools, artifacts and art works. Grafton Music Festival presents high-quality live music events at indoor and outdoor venues in Grafton throughout the year, with a cluster of events around the Fourth of July. The fest performs all types of music, something for every taste. 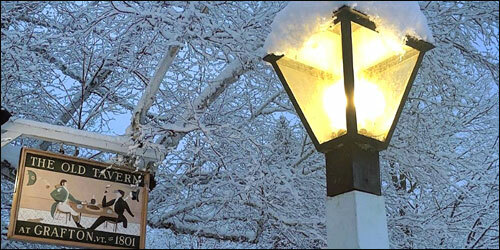 Gallery North Star has become known as Vermont's premier fine art gallery. Situated in a restored 1877 village home, it features the works of over 25 nationally recognized New England artists in a broad selection of artistic styles. Mountain Mind and Movement is a healing arts and yoga studio in town. Several mind and body therapies promote healing and wellness in the body, mind and spirit.